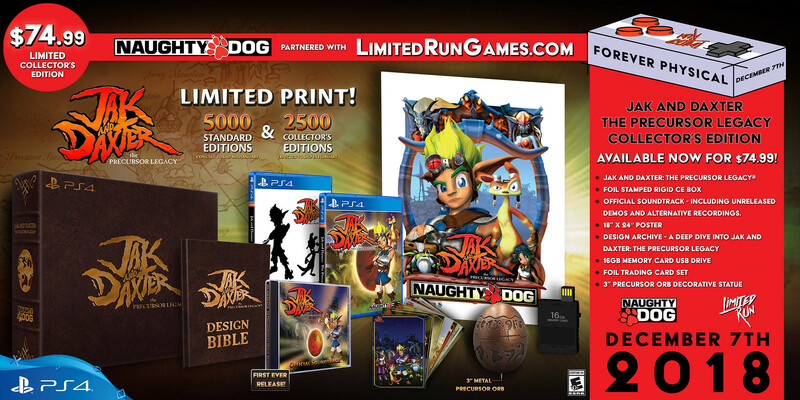 Limited Run Games is bringing all four classic PS2 games in the Jak and Daxter lineup to PS4. Update: Images in blog post updated on 1/17/19. Hi everyone! I’m Josh Fairhurst, CEO of Limited Run Games. We’re a small company that has made preserving digital games in physical form and bringing them to you, the fans of these games, our primary mission. We believe that every game is an important piece of history that should be available in a tangible form for future generations to enjoy. Since 2015, we’ve enjoyed bringing PlayStation fans their favorite digital games in a highly collectible format that respects the developers’ hard work and artistic vision. Jak and Daxter PlayStation 2 games as physical discs available for the PlayStation 4 system. Our first release, Jak and Daxter: The Precursor Legacy is now available to purchase exclusively at www.limitedrungames.com in two editions: $24.99 for the Standard Edition and $74.99 for the more elaborate Collector’s Edition, which contains additional items described below. True to our name, the Standard Edition is limited to 5,000 copies, while the Collector’s Edition is limited to 2,500 copies. Once they’ve sold out, they will not be reprinted! If you miss this first batch — fear not — a second batch will be available in eight hours at 3PM PST/ 6PM EST. We will sell 2,500 copies of Standard Edition and 1,250 copies of the Collector’s Edition in each batch. Our releases can sometimes sell out quickly, so make sure to act fast if you want to own this! Folks who order Jak and Daxter: The Precursor Legacy will receive their game by February 28, 2019. Each game’s Collector’s Edition will include a special item that ties into the game. Jak and Daxter: The Precursor Legacy will include a decorative metal Orb, a USB drive shaped like a memory card, trading card pack, exclusive poster, and a CD soundtrack. This will mark the very first time the Jak and Daxter soundtracks will be released! Additionally, each Collector’s Edition will include a piece of history from the series. We’ve secured never-before-seen historical documents to include in each of the Collector’s Editions. For each game, we will be producing a hardback foil-stamped book containing images from Naughty Dog’s original Jak and Daxter production binders. These binders dive into the world and characters in a depth fans have never seen before and offer a glimpse into how the games were formed. Fans who purchase all four games (either Standard Edition or Collector’s Edition) will earn a free bonus item that I’m truly ecstatic about — a mock case for the game that never was — Jak 4! To be clear, Jak 4 is not a real game, as much as that pains me, and this case isn’t a promise that Jak 4 ever will exist. We’re including this case as part of these releases because our main goal here is to preserve and celebrate the history and legacy of the Jak series — even the parts of that history that never came to be! The mock case will include a code redeemable for a PlayStation 4 system theme based on Naughty Dog’s original late-00’s Jak 4 concept art. There will be no other way to acquire this item outside of this, so make sure to order all four of our releases if you want to own it. Fans who purchase all four games will be mailed the Jak 4 mock case after June 30, 2019. To celebrate the physical releases of the Jak and Daxter series, PlayStation and Naughty Dog are releasing a new classic Jak and Daxter theme for your PS4 system, as well as Jak and Daxter Stickers for Apple Devices — available now on the App Store. 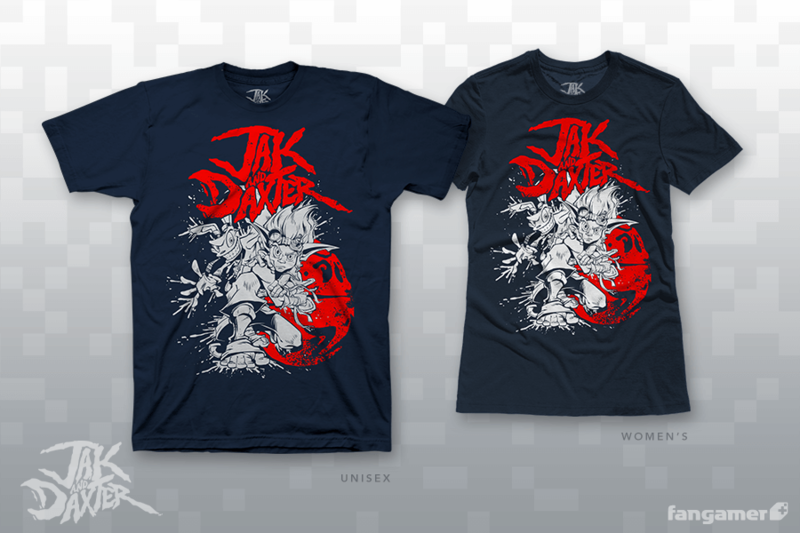 Our friends at Fangamer are also releasing a retro Jak and Daxter t-shirt created by Nina Matsumoto. As fans of their work all the way back to Rings of Power, all of us at Limited Run Games are incredibly honored to be working with the talented team at Naughty Dog to make these physical editions reality! We’ll be releasing Standard & Collector’s Editions of Jak II, Jak 3 and Jak X: Combat Racing by June 2019 (actual release dates may be sooner, but we expect to fulfill all purchases by June 30, 2019). Stay tuned! Got it!! You guys waited until the last possible second to announce this. I’ve been refreshing the blog for an hour to hear what the surprise was. Great surprise and well worth the wait! Glad to hear! We’ve been really excited to announce this for some time. Josh, there was a Jak 4: it was called Jak and Daxter: The Lost Frontier, for PSP and PS2. It may not have been made by Naughty Dog, but it still exists. That was more of a spin off game just like Daxter for the PSP. Daxter was at least produced by Naughty Dog even if it was developed by Ready at Dawn. As far as I know Naughty Dog had no involvement in The Lost Frontier. For those who loved Jak 4, we have a mock case for it that you receive when you purchase all four games (either Standard Edition or Collector’s Edition). We created this mock case since Jak 4 is not a real game, as much as that pains us to say. We wanted to help preserve and celebrate the history and legacy of the Jak series — even the parts of that history that never came to be. Don’t forget about Daxter for the PSP. Will somebody be distribuing this in Europe? We ship products to Europe! Wish I could get this but I have all the games digitaly to bad it wasn’t made before they gave it out digitaly to people. They’ve been selling out pretty fast. Hopefully you can grab your favorite when it releases! As someone whose PlayStation 2 was the cornerstone of their childhood, this makes me so excited because I just recently bought a PS4 and have not yet jumped on the digitals. I love having the physical game. Josh, will there be a bundle release of all 3 games at the end of this run? Or are they only available for purchase individually? Any feedback is appreciated! Did I read that right? You plan on having a bundle of Jak games made by a Sony 1st party developer released on a Nintendo platform? That sounds like major news. And the official reply I responded to disappeared. For a few minutes there was a reply from Josh claiming there would be a bundle of games available in the future for PlayStation and Nintendo! Must have been deleted because that cannot have been true. We’re excited about this classic! We currently have no plans to sell them as a bundle and will be selling them separately. are these versions better than the ps3 versions? i definitely want to support this hopefully the company will go back and make a jak 4!!!!!! No they’re not, the PS3 versions are the better versions. If the PS3 games are really better, that’s just pitiful. @tricker92 – they’re worse versions on PS4. Only get this if you’re a diehard collector or want the items in the collector’s edition. I would like to correct what @Dark_Overlord said. The PS3 versions are indeed the best versions but the PS2 versions (and then PS4) also run at 60fps like the PS3 versions. The Jak and Daxter series is why I wanted a Playstation when I was a kid…it’s also why I’m still around today instead of six feet under. Looks like I’ll have to keep my fingers crossed at 6PM tonight though, since I missed the first wave. Seconding Thefakemichael14’s question: will all of the games be available to purchase as a bundle at the end of the run? We don’t plan on bundling them at the moment. Each one (Jak II, Jak 3 and Jak X) will be available separately. Just to be sure people who buy both this edition and the one ckming out in june will then get the jak 4 case correct? Fans who purchase all four games (Jak and Daxter: The Precursor Legacy, Jak II, Jak 3, and Jak X) will receive the mock case for Jak 4. There will be no other way to acquire this item outside of this, so make sure to order all four of our releases if you want to own it. If you missed the first batch – a second batch will be available at 3PM PST/ 6PM EST. We will have 2,500 copies of the standard edition and 1,250 copies of the collector’s edition in the second batch. Are these going to be the ps2 emulator versions you can buy digitally for ps4 but on a Blu-ray? Why are the text stickers only for iOS, will they be brought to Android? B) From Limited Run Scalpers? All this ensures is that people who want the game aren’t going to get it – except on the secondary market at a jacked up price. Most likely from Limited Run themselves. Will you guys consider doing this for other historic games too? Like Sly Cooper or Ratchet & Clank? 1. When will we be able to preorder the other games? 2. Will these games be in 30 FPS or 60 FPS? I own all the games digitally, if you guys read this, would it be cool if I can have a code for the theme? I own jak 1/2/3 on vita 1/2/3 on ps3 and 1/2/3/X racing on ps4. I have so many questions, and I might be posting more than once. This is all a bit surreal to me. First off, those T-Shirts are amazing! What theme plays during that Precursor Legacy theme? Doesn’t seem to be Sandover Village. Are the JaD stickers on Apple also coming over to PSN? Will Jak II, Jak 3, and Jak X’s standard/collector’s editions be released at the same time, or will they be spread out? Is the second batch the actual final batch for TPL? A big THANK YOU to Fangamer and Nina Matsumoto @spacecoyotl for such a terrific T-shirt design! Funny story about the theme music, although our first intention was to use the Sandover Village theme, as with all things in development we ran into an issue with the original audio files from the game, and since time was short we elected to use audio that wasn’t from the game but did (in our opinion) thematically fit the franchise. How do you like the track? I’m afraid they are not. But please enjoy them iOS. We hope you like the art as much as we do. They will be spread out to minimize the financial impact for those that would like to collect all four editions. Not absolutely sure, but I suspect that is the last of them. I did not catch this reply, oops. Well firstly, it does definitely does thematically fit the game its based on, and I very much appreciate that. After testing with headphones, I can actually now say that I like the theme. Initially (without headphones) I didn’t, but now I like it. Aww, would have loved to use them alongside Horizon Zero Dawn’s and others. Alright, that’s good to know. Hopefully, the announcements won’t be as short notice next times. Very much appreciate the informative response, thank you very much! My heart goes out to all those caught by a LRG release. They have a rep of missing releases with long delays along with providing no information it. Still waiting for everspace my self, was supposed to ship in october, now its up in the air with a 2019 december date. Yeah they really need to SLOW down and stop releasing stuff for a few months and deliver everything people actually ordered in the last year. It’s kind of become a joke at this point. I cant find the physical purchase screen? Is it on retail sites? Our second batch will be available at 3PM PST/ 6PM ET. You’ll be able to purchase it at https://limitedrungames.com/. Where do I purchase??? I need this!!!! On our website at limitedrungames.com! I would love to see the Jak and Daxter games (including Daxter and Lost Frontier) remade just like Activision did with Crash and Spyro. Imagine how great these would look. Is that to say that there still is a possibility for Jak 4 to be revived? How can I purchase the other Jak and Daxter games? Have they already been released? Do I get a second chance of getting them? So far only Jak and Daxter: The Precursor Legacy is available. We’ll have a second batch of limited quantities go on sale at 6pm ET today on our website (limitedrungames.com). The others (Jak II, Jak 3 and Jak X) will be released throughout the next year, we expect to fulfill all purchases by June 30, 2019. You can get your copy of Jak and Daxter: The Precursor Legacy exclusively at http://www.limitedrungames.com. There are two editions: a standard edition ($24.99) and a collector’s edition ($74.99). A second batch will be available today at 3PM PST/ 6PM EST. We will sell 2,500 copies of the standard edition and 1,250 copies of the collector’s edition in this next batch. Once they’ve sold out, they will not be reprinted! if i buy collector’s edition will i get jak x aswell? This CE is for Jak and Daxter: The Precursor Legacy. Jak X will be released at a later date. Stay tuned! so if i buy the collectors edition now will i get it once it’s released or there is going to be another sale but with it included aswell? Today’s sale was for Jak and Daxter The Precursor Legacy. Jak X was not included in today’s sale. Jak X will go on sale at a later date. So glad I got the Collector’s Edition in the 6pm batch. That thing sold out within two minutes! You said playstation and naughty dog will be releasing a PS4 theme as well? When will that be available? Portable how them patches coming along for the collection?? As for the patches, we are very close now. Jak and Daxter TPL patch is complete, patches for Jak 3 and Jak X are very close and almost done. We are trying to fix the turbo flame animation then it should be good to go. Being completely transparent, we were not able to address everything, some of you will still be disappointed with our effort, but hopefully, you will enjoy the fixes we were able to apply. Alright, sounds good. Well I will and still appreciate the effort you and your team put into the collection. It’s nice to see some actual work put into this collection—unlike the PlayStation Vita remaster—and especially rather than just one game. Thank you for your reply and honesty. I just found out about this! Are the collectors edition sold out?! Yes, both the standard & collectors editions have sold out. Pretty upset with you guys it was in our cart hit checkout and made us wait a second and then said good to go then when done filling out card info it said sold out. It should be who types it fastedt it should be whoever hits checkout first. Honestly was very let down that it could get sold out when we already were checking out. You really need to fix that. So i own all 4 games on the playstation 4 after purchasing on the playstation store. Will i recieve the mock case? Wasn’t able to get it. As soon as it turned 6, it was gone. And they’re already on eBay going for $300. I’m sad I missed out on this. I was at work and did not find out till it was sold out. How wil all people get a fair chance to place an order if they tell people at the last second? Hi, I missed out on grabbing one of these during the 10 seconds before they sold out but have managed to secure a copy of the standard edition off someone who was clearly reselling them. I plan on trying to get a copy of Jak 2, Jak 3 and Jak X as they are released and am massively keen on the Jak 4 mock case! Due to me having to buy my copy of someone else does that rule me out from being eligible to receive the mock case? It’s quite frankly ridiculous that something like this isn’t revealed until a couple of hours before it goes on sale and ,for someone who’s only subscribed to the e-mail list, getting notified as the bloody thing went on sale. Didn’t see this until I was home from work and by that time it was far too late to get either one of the editions. 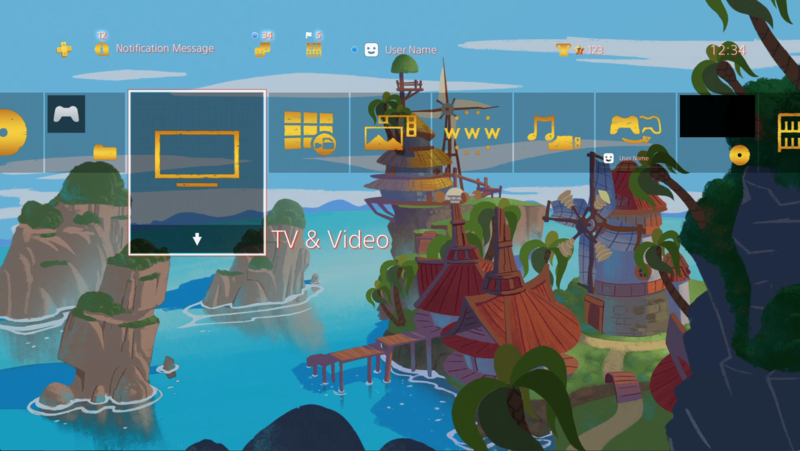 Question about the PS4 theme, is it US only? Can’t find it on my PS store. Whew I got one form the 2nd batch, i’m hoping your company are willing to produce more since a good friend of mine is wanting a copy too and thanks for making waiting list for it. I missed out as I’d only heard of this today. 5,000 was a super small amount for such a coveted game. I understand, Limited Run, can’t produce 250k+ but dam. Do people just check your website every morning to be able to cop a copy of these games. Granted I’m a week late on this one but every single time I go and try getting a game published by Limited Run they’re instantly sold out. I would have bought a fully remastered game. Sorry but I can’t go back to PS2 after the awesome PS3 remaster. Hey. Will there ever be a chance / option to buy ps4 mock case? I missed the first collectors edition sale but i plan to buy the other 3 versions. And is there a chance to get the mock if you buy the first game in ps store and others as collectors edition?